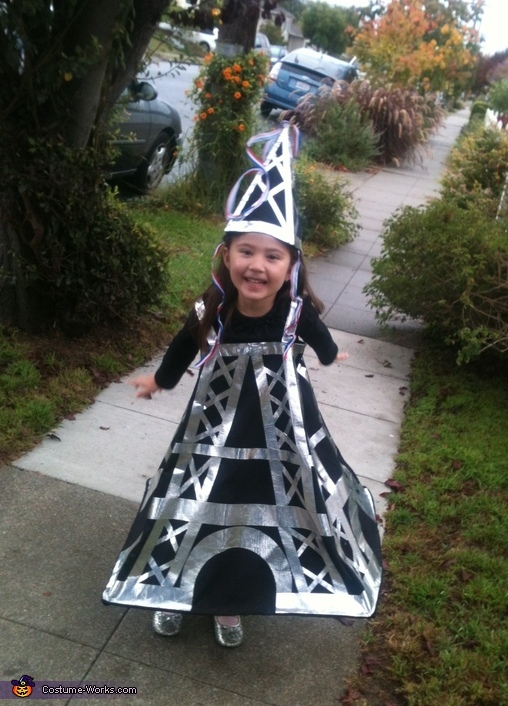 Our little Lucia (Lulu) is wearing an Eiffel Tower costume. It was made of black fabric, some ribbon, some wire and lots of metallic duct tape. How did you make it? I would love to replicate it this year. How did u make this? I just sewed 4 black panels shaped like this /\ and then used metallic duct tape to make the design on. I put a hem on the bottom so that I could insert heavy gauge wire to maintain the shape. Hat, I just sewed smaller panels to some pieces of heavy card (cereal box weight).